Lightweight, but still warm. I bought two of three of these for my sister and her three daughters. Beautiful color!! I wish this color was still in stock as I want to buy a couple for my living room. I highly recommend this product. I am, in the meantime, buying a navy blue blanket. I hope the burgundy/red comes back in stock soon. With an incredibly soft and cozy micro fleece construction, this HS Velvet Plush Home Fleece Throw Blanket is perfect for adding extra warmth to your bed or snuggling up in front of the TV. This luxurious throw is machine washable for easy care and cleaning and the high-quality fabric is antipiling, so it will retain its softness even after several washes. Includes: One (1) throw blanket. Very nice and heavy. The throw blanket is soft and fluffy. 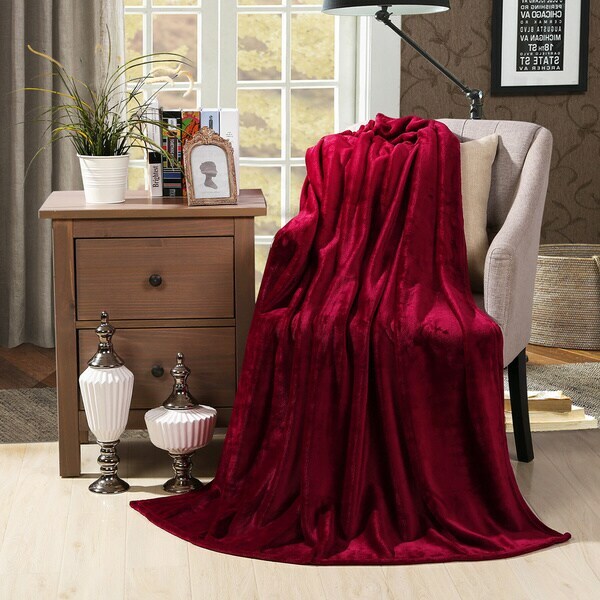 I really love the deep burgundy color and the warm feel of this throw. Very pleased with my purchase and would definitely recommend this for anyone looking for an extra blanket to snuggle up with on the couch. Color and size on the mark..love this throw. Overstock is loaded now with Chinese inferior linens. I once bought all of my sheets and blankets from Overstock. NEVER. AGAIN. I love this throw. Extremely soft I wish I would of ordered a larger one. The color is perfect and the blanket is extremely cozy on those chilly nights. I might even get one more in black if available. Blanket is soft and comfortable. The colors are gorgeous. Highly recommend. This blanket is absolutely delightful. It's very soft . I bought 2 of these for my children and they have been snuggling up with this blanket. I am probably going to purchase one for myself. Grand kids love the new blankets. I bought two for throws on the sofa but the colors did not match. I gave the blankets to the grandkids and they love the soft blankets. My sister loves her gift. Not as heavy as I would have like but still vibrant in color. Good quality; has maintained it's look. Very soft. The color was just as described. Love it! So Soft. Daughter love itl She want me to buy two more and sew them togather for her bed. Was a bit smaller than I expected but didn’t look at measurements. Nice color, goes great in my LR and its soft. Cheaply made, very thin- Not "Plush" at all. To put in my dogs crates! "this was shipped 11/28,is it going to be here by xmas?" never made it for xmas,this is the last time thatI order anything from china!! !2nd time I got burnt!